I check myself—is my prayer complete? I must try to do my best in helping the group to achieve the goal. And when I feel this burden slipping off me, that I am no longer able to keep carrying it, I cry out to the Creator for help—and He helps me, grants the property of bestowal. 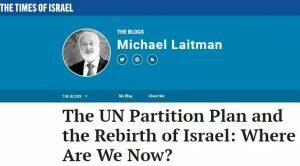 My article “The UN Partition Plan and the Rebirth of Israel: Where Are We Now?” published in The Times of Israel.